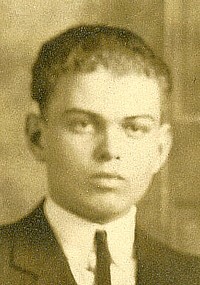 I had an uncle by the name of Ralph Thomas Buckingham, born in 1907. 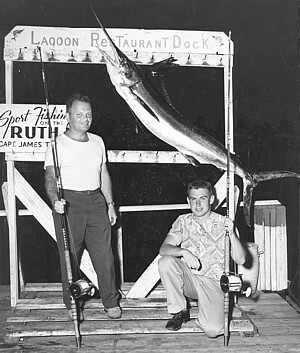 Our family never called him anything but Ralph. 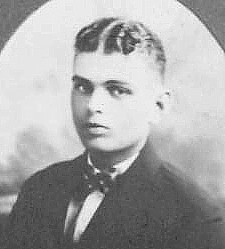 But now, as I uncover more details about his life, I discover that he had a nickname, first among his classmates and later among his co-workers. The Buckingham family, including my mother and her two brothers, grew up on an isolated farm in southeastern Ohio. Then they moved to the big city of Byesville (population 2,775 in 1920). Above is the old Byesville High School building as I photographed it in 2001. 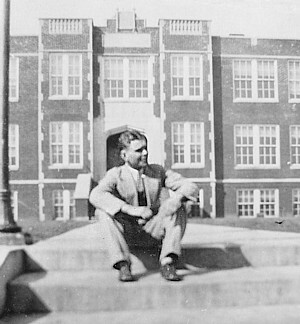 And to the left, in a photo taken 75 years earlier and labeled Buck by my mother, Ralph sits on the BHS steps in the spring of his junior year. 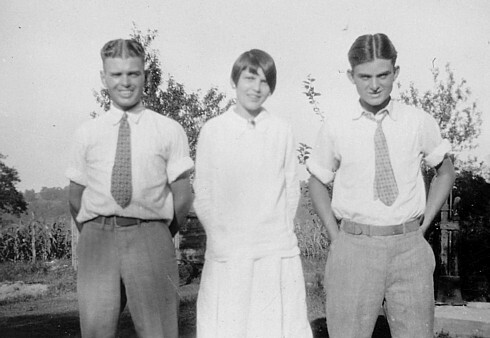 By the time he graduated with the Class of 1927 (right), he was parting his hair in the middle. So was his brother, judging from the picture below of the three Buckingham kids in September of that year: Ralph, Anna, and James. After graduation, Ralph took some business courses at Bliss College in Columbus. My mothers labels on the photos below imply that these were two of Ralphs girlfriends. 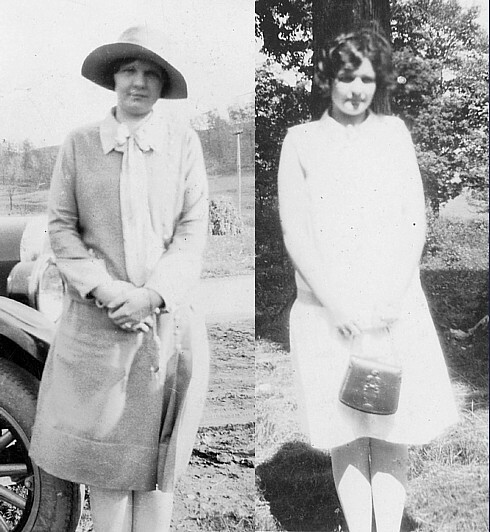 On the left, Bucks Best Girl from November 1926; on the right, Bucks Blue Haven from September 1927. She might have been referring to a hit song published that year: When whippoorwills call and evening is nigh, I hurry to my blue heaven. A turn to the right, a little white light, will lead you to my blue heaven. But Ralph was leaving his Ohio blue heaven. By 1931, "Buck" had become an assistant buyer at Kresges General Offices. And he had met Esther Rauschenberger. Esther, who lived in Ann Arbor, Michigan, was three years younger than him. 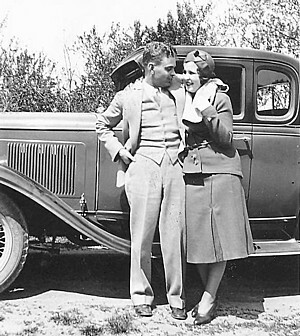 They were an item by May of 1931, when this picture was taken. 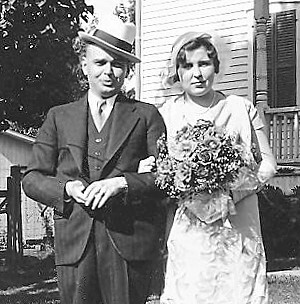 Ralph and Esther were married on July 2, 1932, at the home of an Ann Arbor minister, just a mile from Michigan Stadium. The 4:00 pm ceremony was followed by a reception for 12 people at the home of the brides parents. These pictures were taken there on the family farm. The bride wore a smart afternoon gown of tea rose crepe and net with a small matching jacket fashioned with capelet sleeves, according to newspaper accounts. 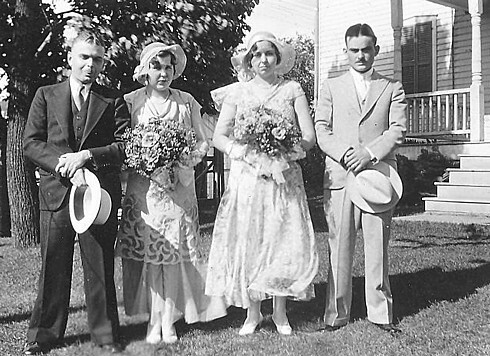 Esthers sister Viola (or Vi) was the maid of honor, and Ralphs brother James (or Jim) was the best man. 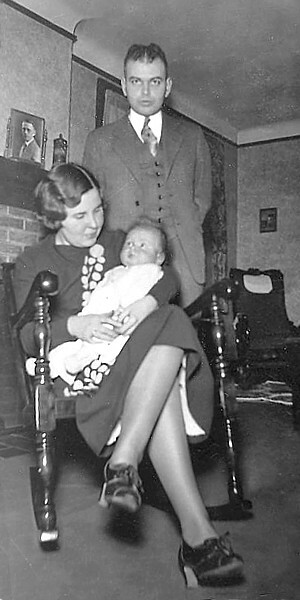 Before long, the couple had a son, Jerry, born in 1934. Two years later came a daughter, Carol. 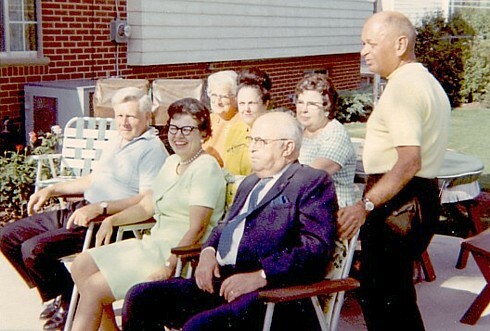 These would be my first cousins, but they were half a generation older than I. 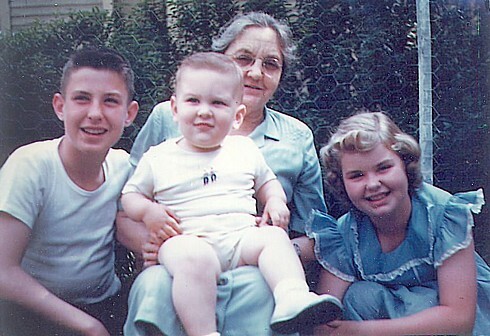 After I joined the family in 1947, my grandmother Emma Buckingham posed (below) with her three grandchildren: me on her lap, flanked by Jerry and Carol. 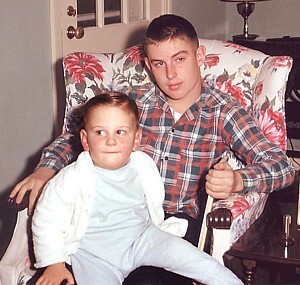 Here I am on Jerrys lap at our new house in Cambridge, Ohio, probably in 1949. 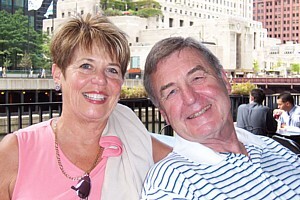 And here are Jerry and his wife Cam (short for Camille), all grown up in 2004. 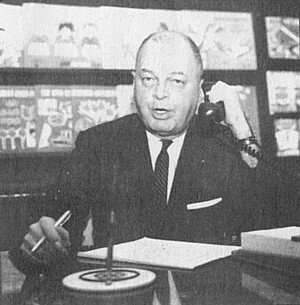 Ralphs subsequent career was summarized in Westernews, the newsletter of the Western Publishing Company. Based in Racine, Wisconsin, Western Printing and Lithographing Co. produced Little Golden Books for children. 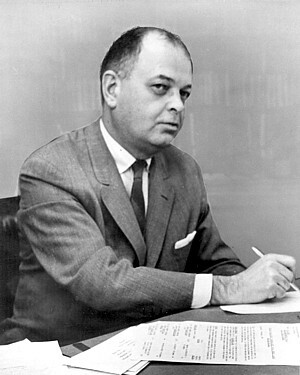 Ralph became a vice president of a Western subsidiary, the Whitman Publishing Company. 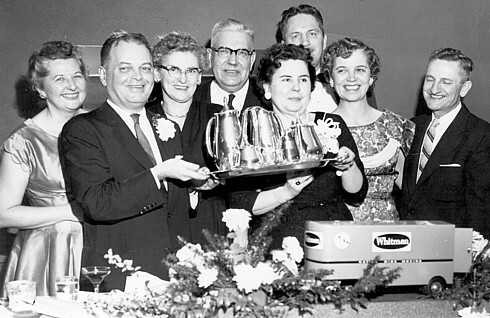 Buck, as he was known to his colleagues, began at Whitman in 1939 as product manager for a stationery line. Two years later, he joined that companys retail division and in 1950 assumed responsibility for its regional chains and mail order houses. 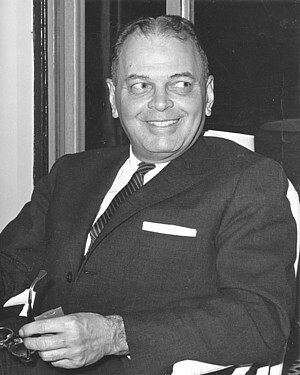 Buck was appointed a Whitman vice president in 1957. Shortly thereafter, he was transferred to New York City in charge of its large, national variety chain accounts in the east. 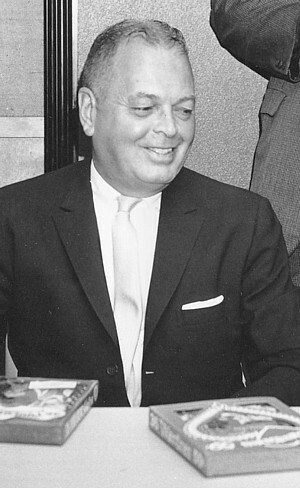 In 1960, Buck was promoted to eastern regional manager under a Whitman sales reorganization. 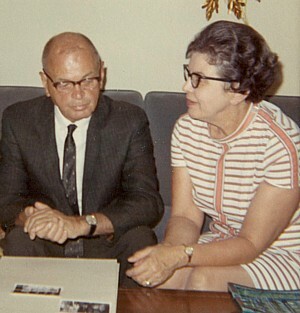 He finished his career in Racine as general sales manager from 1962 (the photo at left is from December 1963) until his early retirement in January, 1964. He also helped my father Vernon Thomas set up an important adjunct to his business. Customers of Vernon M. Thomas Chevrolet who wanted to buy their cars on time could finance the sale through GMAC or a local bank. But now, with the help of some capital from his brother-in-law Ralph, my father could offer another option to customers who were good credit risks: financing directly through Vernon M. Thomas Chevrolet. On those installment plans, my father could collect the finance charges himself instead of letting some bank make the profit. 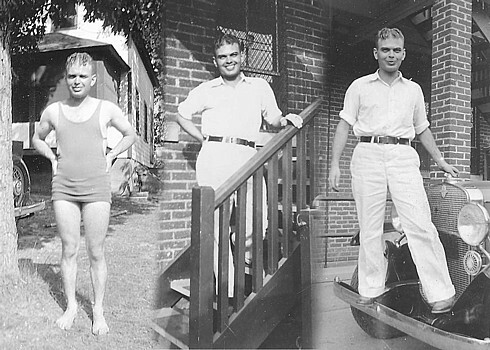 Four and a half years after Ralph retired, I took the picture below at his home in Ann Arbor. 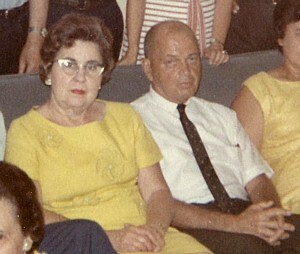 The occasion was one of our Cousin Reunions in July of 1968. But this story has a sad ending, because a few months later, Ralph was greatly changed. As I wrote following the 1969 Cousin Reunion: I saw one of my uncles for the first time since he fell down a flight of stairs and suffered a brain injury. He's had brain surgery and has made an unexpectedly good recovery, but he's still not anything like he was before the accident. He walks like a man of eighty; his voice has changed; he has tunnel vision, and hearing only in one ear and that very weak. His memory is poor: he can't remember incidents from the past, and he can't put together a conversation of more than a couple of sentences because he forgets what he was talking about. 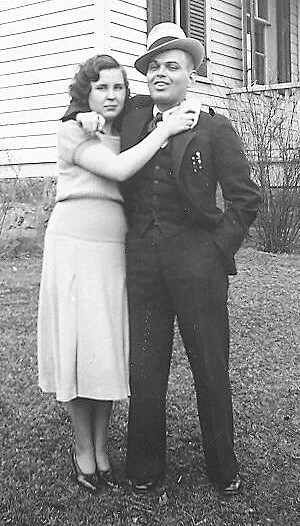 Esther took care of Ralph for another 11 years until he died on March 27, 1980, at the age of 72.